You will enjoy an untypical bathroom. It is made of grey marble and is sunny. It has anything you may need: a bath, a shower, a large bathroom cabinet, a hair dryer, towels, etc... Toilets are separate. The flat is very comfortable, with floor heating to soften the atmosphere in the winter, and efficient air conditioning to refresh your summer days. 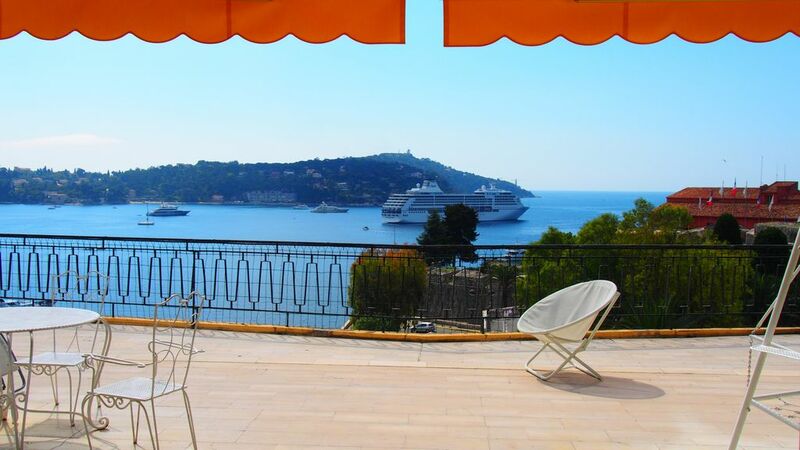 You will enjoy space and an exceptional view over the Villefranche harbour. The dining room is made of marble and wrought iron, and is suited for 4 to 6 people. A sofa will enable you to relax and watch T.V. You will also use the outdoor table, the swing seat... Furthermore, a parking space may be available and at your disposition. Fantastic views. Close to everything. and taking in the views. We really enjoyed our stay in Villefranche-sur-mer. The apartment has a unique terrace with wonderful views of the sea and the old town. We appreciated very much the natural light effects that the riviera offers. However we would like to say that at such location this apartment deserves a serious renovation because at the moment the price-quality ratio is not really correct. We have recently returned from a week-long stay here. The apartment is on the 4th floor and has an unrivalled view of the harbour, streets and park. Honestly every time we came into the apartment or out from the shower, the ..wherever the view really does take your breath away. The kitchen is small but perfectly well equipped, the bathroom has a large bath and a good shower. The bedrooms are fine the master has patio doors and overlooks Villefranche. The balcony is stunning, it is spacious and as such affords privacy. The swing seat is perfect at any time of day but especially in the evening with a cool glass of Provence Rose. The wifi is excellent too. We didn't meet Catherine the owner but all communications excellent, the local manager Oscarro is lovely, Deposit returned quickly. All super! Villefranche itself is beautiful and a perfect place to explore the coast, the station is a ten minute walk away from the apartment and you can get a train to Cannes, Antibes, Nice or to Monaco and Italy - all within 40 minutes! A really nice place. Good space and everything you need. We staid for 10 days and spent every evening on the terrace with a glass of wine, looking at the amazing view and all the beautiful yachts. Could need some updates when it comes to renovation, otherwise no complaints. Big plus is the private parking just next to the building. Très bel appartement avec un grand salon/salle à manger. Vue spectaculaire sur la baie, la mer et le village de l'immense terrasse avec table, chaises relax. Finalement on passe le plus clair de son temps là, à admirer la vue, les bateaux, les activités et festivités locales. En plus l'appartement est à deux pas du cœur du village, la mer, le port et les restaurants. 6km away from the town center of Nice, 8km away from the principality of Monaco, you are at the heart of the French Riviera. So close to the charming villages of St Paul de Vence, Eze, Turbie, etc... All the famous events, such as the Nice carnival, the Monegasque nightlife, the casinos, Cannes and its film festival, visits to the many museums, such as the oceanographic museum of Monaco, museums of famous painters, numerous gastronomical restaurants, and much more are within your reach. The actual village is listed: its sheltered pedestrian streets are part of its charm, the harbor will welcome you with its many restaurants and your walk will take you to the beach, at the end of the pier. L'appartement se loue de manière saisonnière, à la semaine, la plus part du temps hors vacances scolaires... la semaine la plus basse est de 1200 euros, la plus haute 1500, dont 30 pour cent à la réservation. Le solde 3 semaines avant. Sur place il vous sera demandée une caution de 500 euros restituable après état des lieux. Pour le ménage et le linge, il vous sera demandé 50 euros.